The Chicago Cubs have made some big roster moves over the course of the offseason, but with the acquisitions of Miguel Montero and David Ross to bolster their catcher position, the big question is what they plan to do with Welington Castillo. Castillo, who hit 13 home runs and drove in 46 RBI for the Cubs last season, isn’t the best catcher defensively behind the plate, and that coupled with his youth led the Cubs to act this winter as they brought aboard a couple of veterans with leadership ability and defensive skill. #Cubs seem to be leaning toward 3 catchers. Maddon says having Welly will help them keep Montero, Ross healthy, also extra bat. Muskat also brought up a good point about the versatility that players like Arismendy Alcantara (who has been seeing time at second base and in center field this spring, and could also potentially fill in at third base in a pinch) and Tommy La Stella (who has been squaring the ball up nicely at the plate and can play several infield positions) bring to the table, and how that could potentially allow the Cubs to carry three catchers out of Cactus League play. Even with that being the case though, it’s hard to imagine the Cubs holding onto all three catchers. Ross is probably going to catch quite a bit when Jon Lester is toeing the slab (although all three catchers have caught him so far this spring), and Montero wasn’t brought aboard to be a platoon guy. That leaves Castillo as the odd man out, and no matter how much the Cubs say that they are looking into keeping three catchers on their roster, it just feels like they’re trying to maintain a higher trade value for a guy who could be a lucrative asset as catchers with other teams succumb to injuries this spring. With teams preparing to head to their respective spring training facilities in Florida and Arizona this week, there is a palpable excitement in the air as fans prepare for baseball season to finally arrive. With those preparations taking place, Las Vegas is ratcheting up its game as well, as website and sports books come out with their projections for how the baseball season will shake out. Bovada is one such place, and they released their over/under win projections for all 30 teams on Monday. The Los Angeles Dodgers and Washington Nationals top the list, with both teams seeing their win totals set at 92 ½. The Los Angeles Angels follow close behind at 89 ½, and the St. Louis Cardinals, Boston Red Sox, and Seattle Mariners round out the top five (the Red Sox and Mariners are tied at 86 ½ wins). Sitting just outside of the top 10 are the two Chicago teams, with the Cubs at 82 ½ wins and the White Sox just behind them at 81 ½. Both teams made some significant moves this offseason, with the Cubs bringing in guys like Jon Lester, Miguel Montero, and Joe Maddon and the Sox adding Melky Cabrera, David Robertson, and Jeff Samardzija. Both teams are optimistic that their farm systems will begin yielding talent this year. Hopes are, needless to say, high on both sides of town. The question then is whether or not we would bet the over or the under on those win totals. For the Cubs, that number seems about dead on with what we’re expecting from them this season (we’ll delve more into that as spring training begins and we really start to hammer out our predictions), but the under seems like a safer bet. They could end up going way over that win total if the prospects they’re calling up have good seasons, but we still have questions about the pitching staff and whether or not guys like Javier Baez will perform as advertised, so we’ll put our money on the under. As for the White Sox, the over seems like the better bet. Their pitching rotation is really solid at the top, and their offense should be pretty good as well with Jose Abreu and Alexei Ramirez leading the way. Questions do arise with their bullpen even after the acquisitions of Robertson and Zack Duke, but in a weak division, we’ll go with the over on their win total. 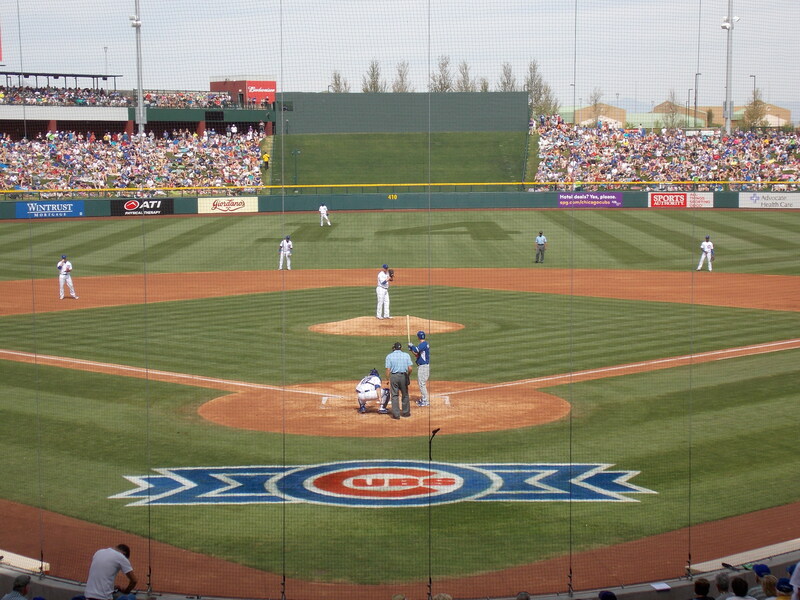 As the Chicago Cubs prepare to head out to spring training in Mesa, Arizona, Windy City Hardball is previewing each of the positions on the field for the team (and pretending we’re heading to Phoenix ourselves to enjoy the warm weather). We get things started today with the catcher position. The Cubs made one of their biggest moves of the offseason during the Winter Meetings, acquiring Miguel Montero from the Arizona Diamondbacks in exchange for pitchers Zack Godley and Jefferson Mejia. The veteran catcher is not only a solid hitter that will likely hit in the fifth or sixth spot in the Cubs’ order this season, but he is also one of the absolute best defensive catchers in the game. Last season, Wellington Castillo was statistically the second-worst catcher in baseball in terms of framing pitches, costing the Cubs 24.3 runs on the season according to the good folks at Stat Corner. Montero, on the other hand, was baseball’s best catcher at pitch-framing, saving the Diamondbacks 24 runs. While Montero may not hit as well as Castillo (and that is frankly a big if, because he may well hit better), the fact that he gives the Cubs a net boost of 48 runs just by being able to frame pitches is a HUGE asset to have. At this point, it seems unlikely that Castillo will remain in the picture at catcher for the Cubs, considering that the team went out and acquired David Ross in free agency. The catcher was Jon Lester’s personal catcher with the Boston Red Sox, and even though his numbers have been declining a bit (he had a -0.16 WAR last season, and his slash numbers have been declining as well), the fact that he brings leadership and veteran experience to the locker room is a big asset for the Cubs. Ultimately, the odds are that Castillo will be dealt to keep Ross on the roster, but the Cubs could get a decent bullpen arm or a couple of decent prospects in exchange for him via trade. As of this moment, we have the Cubs’ catchers ranked as their fourth-best position on the big-league roster. If they were going to stick with Castillo as the back-up, they may have gone up a spot due to the offensive improvement, but having Montero and Ross as the two guys behind the dish is still a pretty solid tandem, and Montero’s defense is something that is really going to save the Cubs some runs this season. The Cubs have one guy who could potentially be a game-breaker at the plate in Kyle Schwarber, but they don’t really have a stud defender behind the dish. Schwarber could potentially end up as the catcher of the future, as Montero has three years left on his current deal, but odds are the team will want to move him to the outfield to let him focus on his hitting. Outside of Schwarber, there are a couple other prospects to look out for. Victor Caratini is one guy that we’ve been impressed by, and he is a really smart player all around. Mark Zagunis is also a guy that could potentially be an outfield/catcher hybrid, but he’s fast as all get-out and draws tons of walks, making him an attractive option as well. Cubs vs. White Sox: Who Has Had the Better Offseason? If there has been a dominant theme at baseball’s Winter Meetings over the past few days, it’s been tinged with blue stripes and red stars. The city of Chicago is absolutely holding court on one of MLB’s biggest stages, with both the Cubs and the White Sox addressing major needs and making huge splashes all over the place. Now, with the Winter Meetings close to concluding, we have an opportunity to evaluate where each of the teams stands in terms of their offseason to-do lists. Which one is having the better time of restructuring their roster? Let’s find out. The Cubs came into the offseason needing to add a top of the rotation pitcher, and they also wanted to add a different, more defensively proficient catcher to the mix. They’ve done both of those things, signing Jon Lester to a rich contract and trading for Miguel Montero from the Arizona Diamondbacks. While they will still be making moves as the offseason wears on, the White Sox have done a better job of addressing more of their needs. Right-handed pitcher to slot between Chris Sale and Jose Quintana? Done. Relief pitchers to shore up a horrendous bullpen? Done and done. A left-handed bat to help protect Jose Abreu in the lineup? Done. The Cubs have really done a great job of addressing some of their needs, but Rick Hahn has really done some great work in shoring up the Sox roster. While names like Adam LaRoche and David Robertson certainly move the meter in terms of what they can do for a team, they are no match for the talent that the Cubs have brought in. Montero is a pretty big name (at least from a catching perspective), but Lester was the top of the heap in terms of available pitchers, and landing Joe Maddon went a long way toward showing the baseball world that the Cubs mean business. The Cubs shelled out a ton of money for both Maddon and Lester, and the White Sox really paid a ton for Robertson to come protect the back end of the bullpen. They did get some really nice value in signing LaRoche for two years, but the one that’s most intriguing is adding Zach Duke for $5 million per season. He could be an excellent eighth inning guy, and the Sox could presumably use him in closing duty if Robertson is injured or needs a day off. Having that kind of an arm in the bullpen is a huge asset, and while neither team has been particularly frugal this offseason, the Sox hold a narrow edge. The Sox made a big move by trading for Jeff Samardzija on Monday at the Winter Meetings, but there is no guarantee that they will be able to sign him to a long-term extension before he hits free agency after the 2015 season. LaRoche is also signed for just two years, and while Duke (three years) and Robertson (four years) are signed for slightly longer, none of them figures to be a player that the White Sox build themselves around for the next five or more years. On the other side of town, the Cubs’ additions have the potential to be those kinds of cornerstones. Of course, you get what you pay for in that regard, with Lester being signed for seven years, but the real thing that pushes this category into the Cubs’ column is Maddon. Adding him to the mix not only signals a seriousness of purpose on the part of the north siders, but it also means that the team will be able to get the most out of the young players working through their system, and by proxy means he’ll make a larger long-term impact than any other acquisition by either team this offseason. Both teams have made big splashes and important moves that have them poised to be a lot better in 2015, but we have to give the narrow edge to the Cubs in terms of the quality of their offseason. Maddon and Lester are a formidable combo that is tough to beat, but the White Sox and their additions of Samardzija, LaRoche, and Robertson do come very close. It’s a tight race, but it looks like the north siders win by a nose. With Lester in the Fold, What is Next for the Cubs? If Theo Epstein and Jed Hoyer had drawn up a wish list before the offseason began, Jon Lester would have likely been at the top of it. On Tuesday night, they were able to add a check mark next to his name, signing Lester to a six-year deal worth a reported $155 million. The news came as a delightful surprise to Cubs fans who were preparing themselves for the worst, waiting for the Boston Red Sox or San Francisco Giants to swoop in and grab Lester out from underneath them. Instead, an offseason that began with the Cubs bringing in Joe Maddon to be their manager has hit a crescendo with the biggest name on the free agent pitching market heading to the north side. The question now is a simple one for the Cubs: what comes next? The team has already addressed some of their biggest holes, adding a top of the line starting pitcher in Lester, bringing in more rotation depth with Jason Hammel, and bringing in an excellent defensive catcher in Miguel Montero. Other players from the minor league system will certainly be on the way to plug holes, with Kris Bryant likely joining Javier Baez and Jorge Soler sooner rather than later at the big league level. All of those things are great, but there is still work to be done. Some reporters, including Ken Rosenthal, believe that the Cubs will continue to pursue a big veteran bat to add to their lineup. Whether that means trading for a big-name player like Matt Kemp or Justin Upton, or signing another free agent like Chase Headley, the Cubs could look to accelerate their rebuilding process even more than they already have by acquiring another bat. Outside of making another big splash, there are still plenty of areas where the Cubs could shore up their roster. Adding another starting pitcher wouldn’t be out of the question, so a guy like Justin Masterson could be an interesting player to keep an eye on. He would likely come cheaper than some other options, and he would add more competition in a rotation that is already significantly deeper than it was over the past few years. The Cubs could also be looking to move a starting pitcher or two in order to bring in other pieces. Travis Wood could be one of the guys moved, as he would likely yield a nice return in the event of a trade. He would also provide a really nice third or fifth starter for the Cubs, depending on where they would like to slot him, and so Epstein and Hoyer would have to make a tough choice in that regard. Moving Edwin Jackson’s contract will also be a key thing for the Cubs to do. It will likely mean taking on another contract that a team is looking to unload, but if the Cubs could find the right trade partner, they could turn arguably the biggest mistake of the Epstein/Hoyer regime into less of a misstep. The Cubs are obviously not where they want to be as an organization, but they are quickly making their way in that direction. With a new manager, a huge free agent acquisition, and a major trade, they have made massive strides toward competing in 2015, and with some more tweaks and additions, they could be poised for an even bigger leap toward World Series contention than they are at the moment. Yesterday, we brought the blog out of dormancy to discuss the possibility of the Chicago Cubs signing Russell Martin to a contract. A four-year pact would have been a risky move, especially with a $16 million per season price tag, but with Kyle Schwarber still at least a few years away from the majors and Wellington Castillo not exactly making a strong case to remain the team’s backstop, it would have made sense for the Cubs to make the move. Of course, just because a move makes sense doesn’t mean that it will happen, and the Toronto Blue Jays swooped in and signed Martin to a five-year deal worth $82 million. That figure is likely well over what the Cubs wanted to pay out for Martin, who will turn 32 in February, and the added bonus of playing in his hometown was likely what sealed the deal for the catcher to play in Toronto. For now, the Cubs are going to be forced to proceed in one of two directions if they still want to explore the market for a catcher. They can either sign one of the remaining free agents (Geovany Soto and AJ Pierzynski are the two biggest names still available), or they can pursue a player via trade. Arizona Diamondbacks catcher Miguel Montero has been mentioned, as the team could be looking to shed the remaining three years and $40 million left on his contract. To be honest, free agency doesn’t sound like the way to go at this point for the Cubs. They have plenty of other needs, most notably at starting pitcher, and overpaying for a guy like Soto would almost be a lateral move to just letting Castillo continue on as the team’s catcher. Making a trade for a guy like Montero could make more sense, as a three year deal worth about $13 million a season isn’t completely unreasonable. If the Cubs could find the right package of prospects to make a deal like that happen, it’s one that they should strongly consider. He’s a solid hitter, hitting 13 home runs and driving in 72 RBI in 2014, and his skills at limiting stolen bases were also on display for the Diamondbacks, as he gunned out 29% of would-be base stealers (good for fourth in the National League).